Presidential hissy fits have consequences, and Donald Trump’s twitter tirade against ‘Hamilton’ the musical shows just how dangerous his words can be – because his supporters are threatening violence in retaliation. 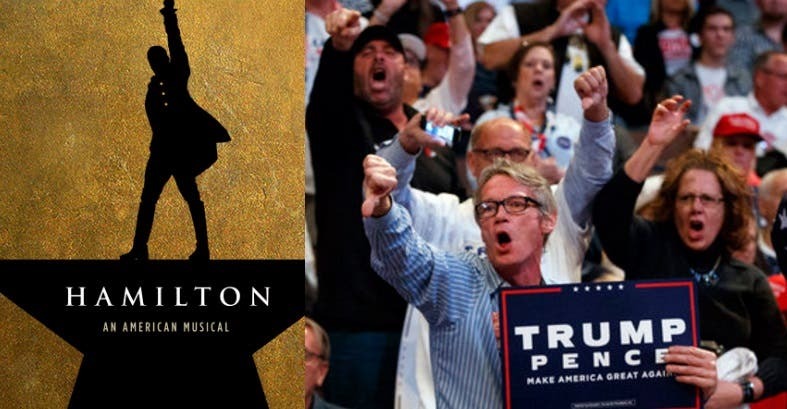 This week, Trump supporters forced the Hamilton actors’ union to hire extra security in the wake of President-elect Trump’s attack on the cast and free speech rights this weekend. Property management at the Actors’ Equity union’s Chicago location notified all tenants of the building late yesterday that extra security was going to be hired in response to threats by rabid Trump fans. The century-old Actors’ Equity union made national news earlier this year, for negotiating a profit-sharing deal to benefit the original cast of Hamilton, whose performances earned the show an astounding 11 Tony Awards this year. They also represent over 50,000 other actors and stage managers across the United States. America’s most seminal law is our First Amendment’s guarantee of not only free expression, but the right to petition the government. Unfortunately, Trump supporters have decided that the actors’ union fighting for workers’ rights and better pay is little more than a fixed target for harassment since they dared to speak out against the bigotry and division of the Trump-Pence camp. The President-elect will deny any role in this fiasco, because he’s not personally calling the union to threaten violence, or personally directing a supporter, but make no mistake, this is Donald Trump’s fault. It is stochastic terrorism. By refusing to address the violence perpetrated by his followers, he is tacitly endorsing it, fostering a climate of fear and hate that entrenches his power. Mike Pence himself told CNN that he wasn’t offended by the Hamilton cast’s remarks, but because he and his running mate have only spent time spreading anger and hatred, his supporters are using a vicious form of emotional blackmail to chill free speech. Author’s note: When asked for comment by phone today, neither Colliers or Actors’ Equity replied in time for publication.